Want to see inside the artisan studios of Florence? Wine optional! Lost In Florence celebrates the best venues in Florence and not the obvious. 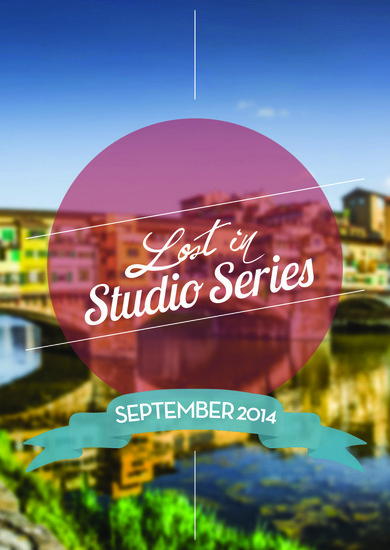 This September we are hosting a series of events giving you access into the artisans studios. From jewellery making to pottery painting, wine tasting to calligraphy creation, go behind the doors of unique spaces to explore and meet the artist too. 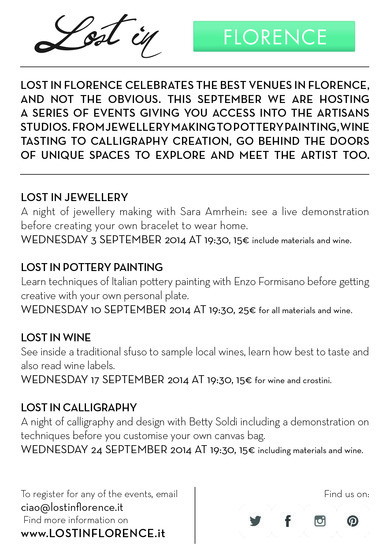 Lost In Florence has proudly teamed with designer Sara Amrhein to host a night of jewellery making over wine. Come inside her Sant Ambrogio studio to see a live demonstration before creating your own bracelet creation to wear home. Wednesday 3 September 2014 at 19:30,15 euro include materials and wine. Florence is a city of art that constantly inspires. We’ve teamed with pottery master Enzo Formisano to host a night of pottery painting. The event kicks off with a brief tutorial before you get creative with your own personal plate. All plates will be fired and for you to keep. Wednesday 10 September 2014 at 19:30, 25 euros for all materials and wine. Lost In Florence loves wine, so do the gang at Il Santo Vino. Come inside their Santo Spirito sfuso for a night of wine tasting to discover the Tuscan classics. Learn how wines are made, how best to taste and also read the labels. Five blends will be served alongside crostini. Wednesday 17 September 2014 at 19:30, 15 euros for wine and snacks. If you love design and handcrafted products, you must visit & Company. The design studio and shop run by Betty Soldi is a magical mix of homewares, up-cycled furniture and paper products to own. We’ve teamed up to host a night of calligraphy design, beginning with a demonstration on the techniques before you customise your own canvas bag. Wednesday 24 September 2014 at 19:30, 15 euro including materials and wine.